This article explains how to estimate the electrical service size, ampacity rating, (or "electrical power" or "service amps") at a building by visual examination of the electrical service panel, main switch, and other details. In this article series we describe how to recognize different vintages, ages, types of electrical panels and how to find the components that define the ampacity rating of the service equipment. Visual inspection and use of digital multimeters(DMMs), Volt-ohm meters (VOMs), neon testers, and electrical inspection safety are also discussed. We include photographs and sketches illustrate electrical panels, meter bases, and electric meters. A frequently asked question at home inspection education conferences is "How do I determine the electrical service amperage or size?" This article describes inspecting the ampacity or size of the main disconnect and/or main electrical panel. Safety concerns attend any electrical system inspection. See SAFETY for ELECTRICAL INSPECTORS at Residential Electric Panels. Watch out: Do not attempt to open an electric panel without making yourself familiar with safe procedures. Watch out: Do not open or even touch electrical equipment if you find dangerous conditions, or simply uncertain conditions which give cause for alarm. If you elect not to examine a component, indicate to your client that you did not inspect the component, explain why, and recommend appropriate steps to make access and inspection safe and possible. Document this information in your report. Home inspectors or electrical inspectors who touch electrical wires or move them in order to better read the data tag are performing a dangerous act. 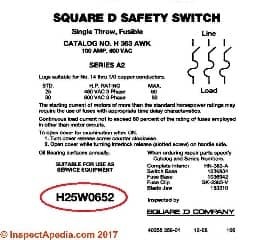 We look for an electrical panel brand, model & data tag (usually paper) or embossed rating (on fuse pull outs) on the panel itself which often includes the amperage rating of the panel. This information is usually present in newer panels on a panel side, or on the panel cover. 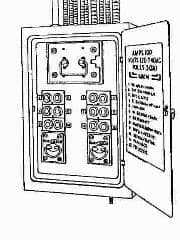 Electrical Panel or load center model number and serial number. 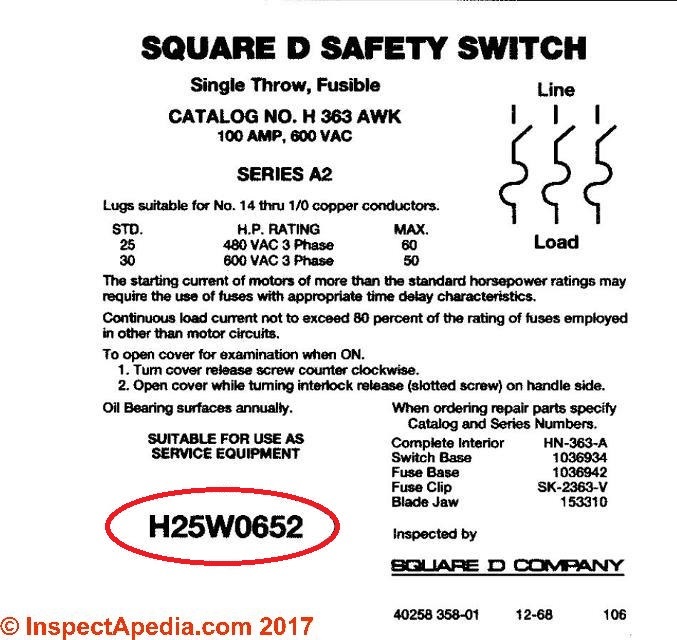 To decode a serial number to find the age of an electrical panel see ELECTRICAL PANEL AGE. Actual dimensions of an electric panel are not a reliable determinant of ampacity. For example, many larger panels can be fitted with a variety of bus-bar and main switch assemblies of varying ampacity. Older 30-amp fuse panels typically have round 15-amp or 20-amp fuses installed on both hot and neutral conductors,[Figure at above left] and sometimes a separate main fuse switch. There are safety issues with fused-neutral equipment - not discussed in this article. Simpler 30-amp panels or sub-panels like the smaller four-fuse panel shown at immediate left are usually auxiliary rather than main service panels in most buildings. An exception which the author's have found is that this panel was used as a main service for small lake and other remote cottages. Where such buildings have in more recent years had additional electrical circuits installed, for use of electric heaters, for example, such panels are often overcrowded and very often the individual circuits are over fused - a fire hazard. Older 60-amp fuse panels [first panel shown above] and some 100-amp panels [Figure at left] often have a single or a pair of BakeliteTM fuse holders, one marked "main," the other marked "range." In typical installations, the "main" fuse pullout shuts off power in the panel except the range circuit. This main should contain 60-amp or smaller fuses. Both main and "range" pullouts must be removed to cut all power. The example at left used a 60A fuse supplying the lighting circuits (fuses in row along the panel bottom) and a 40A 240V appliance circuit is supplied by the "range" fuse pair. 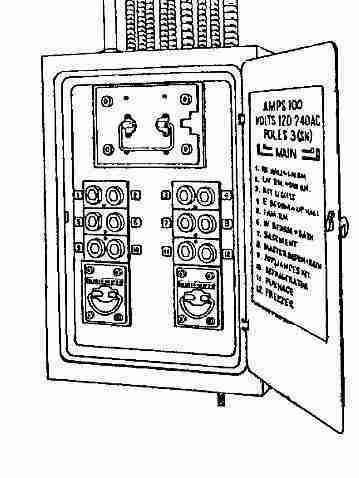 100-Amp fuse panels: The next panel shown above is a 100-amp (or larger) fuse panel using a main fuse holder centered in the top of the panel. The two fuse holders for two 240V circuits at the panel bottom are not mains and were often used to supply a range circuit and clothes dryer circuit, or range and sub panel circuits. 125-amp CB panels are often fitted with a 100-amp main disconnect CB or fuse-pair. In this case the electrical inspector should ignore the larger equipment panel size (perhaps indicated by an inside-panel label) and instead s/he should rate the electrical service ampacity based on the main CB or fuse-pair. Readers of this article should also be sure to review SAFETY HAZARDS & SAFE ELECTRICAL INSPECTION PROCEDURES for examining Residential Electrical Panels. Based only on apparent panel size and provision for 24 circuits, this larger panel at left, showing a modern main CB at the top and two 12-breaker columns is at least a 100 Amp box, maybe 150 Amps. Better check the service conductors, main CB, and panel label. In the multi-pullout 100-amp fuse panel shown next at left, all four of the top pullouts are mains. All four should be labeled mains. This is a tougher one since, as Hansen points out, [Hansen, op. cit.] the sum of the ratings of the different disconnects may exceed the capacity of the conductors. For example you can have a 125A service with two main disconnects, one rated at 100 amps and one rated at 50 amps. In this case we'd look at the rating of the service conductor and the service equipment (panel) for help. Continue reading at MAIN DISCONNECT AMPACITY or select a topic from closely-related articles below, or see our complete INDEX to RELATED ARTICLES below. Or see ELECTRICAL INSPECTOR SAFETY PROCEDURES important basic safety procedures, clothing, and equipment for home inspectors and electrical inspectors. ELECTRIC PANEL AMPACITY at InspectApedia.com - online encyclopedia of building & environmental inspection, testing, diagnosis, repair, & problem prevention advice. Questions & answers or comments about how to estimate the electrical panel size or capacity - amperage rating of an electrical panel.